Red Dead Redemption 2 is a prequel to the 2010 open-world Western, but I hesitate to say that it shares the genre. Like Calloway’s quest, the game isn’t quite what it claims to be. Set almost entirely within the American South two decades after Reconstruction, it tells two parallel stories: one, a fish-out-of-water journey featuring good-hearted criminal Arthur Morgan and his colleagues, all members of a notorious gang; the other, about the hollowness of mythmaking in the American West. It’s the latest entry in the trend of games that seem paradoxically crafted with love and a potent dose of self-hatred. Safe to say, Red Dead Redemption 2 is the weirdest, slowest, most confounding big-budget game of this decade — if not any decade. 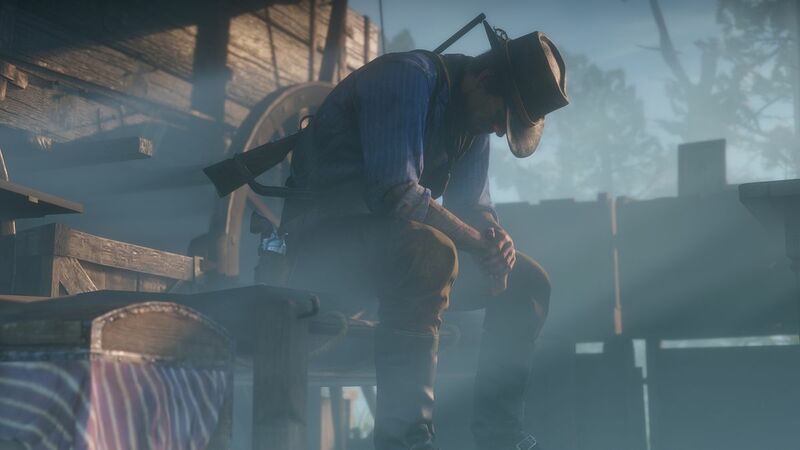 I’ve spent dozens of hours in Arthur’s boots, and for most of them, he behaves like just another member of an ensemble cast, offering a window into the day-to-day life of the men and women who have bought into the promise of their leader, Dutch van der Linde. They share stories about the old days that Calloway’s biographer would turn into a pulpy Western, but if a golden era ever really took place, it has unquestionably passed by the time this plot begins — a truth Arthur struggles to make amends with. 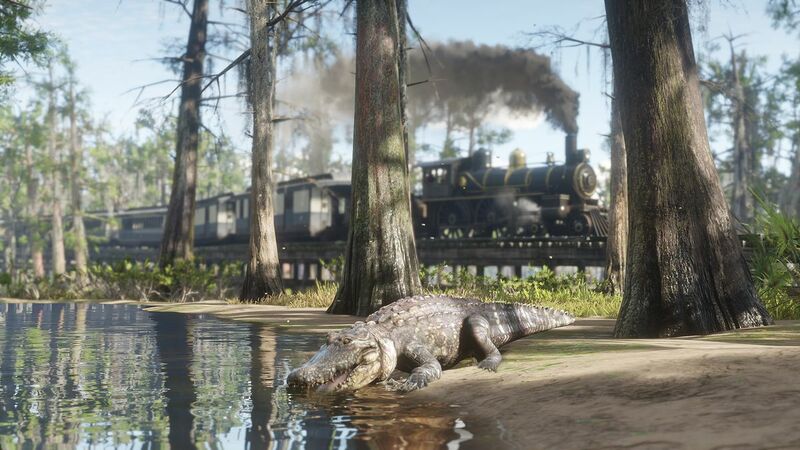 Following a mysteriously botched job led by Dutch that ended with the death of an innocent bystander, the notorious Van der Linde Gang is moving eastward, outside the game’s equivalent of Texas and into the American South. Real states, cities and even politicians have alternate, fictional names here, with the creators taking inspiration from a moment but not recreating it precisely. I meet Arthur as he guides the gang through a tough Ozark winter. In no small part thanks to Arthur’s modest co-leadership, the Van der Linde Gang — composed of men, women and a child — survives the elements and the rival O’Driscoll gang, establishes a camp, and tries to recreate its Robin Hood-esque lifestyle of righteous crime in pursuit of financial security and freedom from the law. Rockstar Games’ Grand Theft Auto series has focused largely on men who adopt a life of crime in pursuit of the unattainable American dream, but the members of Dutch’s gang largely seem to have been wronged by the nation and want freedom from it. Every step of their journey is taken toward that one big job that can solve all their problems. Loot. Don’t rush. Love the horse you have. 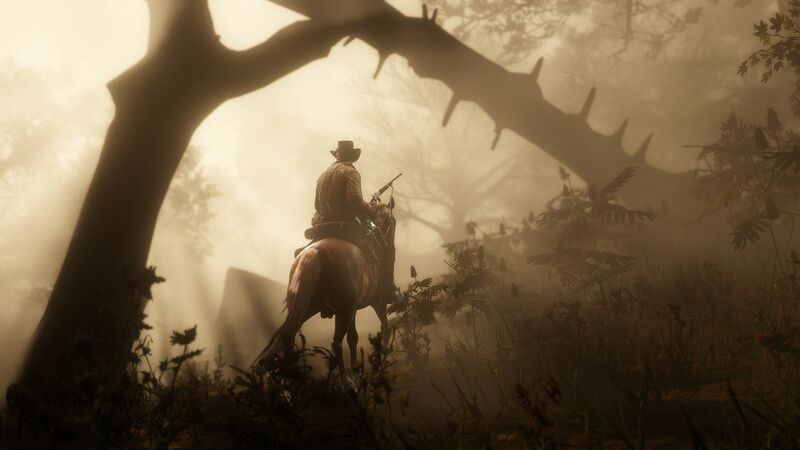 Red Dead Redemption 2 has a central storyline, plotted on a map of the game’s world in yellow dots. But the world is brimming with additional paths Arthur can choose to take along the way, themselves branching in various directions. Most are unmarked, and their events unfold in medias res. Similar moments appeared in the original Red Dead Redemption, but they’re dwarfed by the depth, variety and interactivity happening here. While searching for a former member of Calloway’s gang, I come across a man who is being attacked by wolves. I scare the animals away with a shot in the air and offer the man medicine — medicine that, I realize as I offer it, can hardly treat his mangled leg. He bleeds out, cursing me. Around the 20-hour mark — roughly one-third into the game — the story sets a stride, and I begin to establish my own rhythm alongside it. 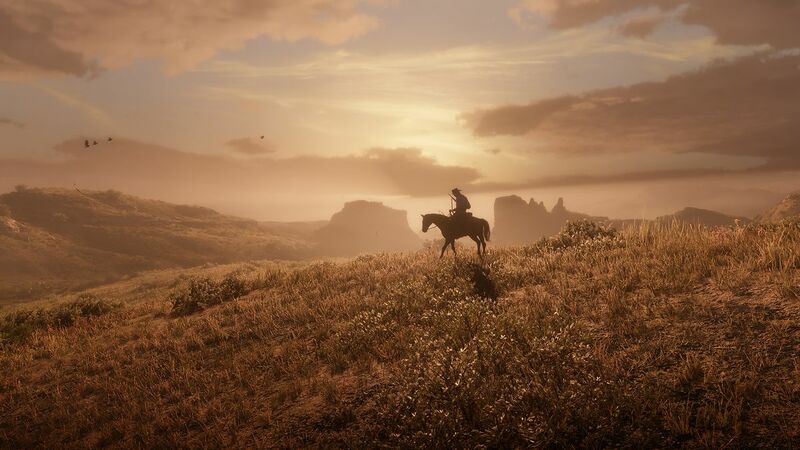 Days pass slowly in the game’s universe, and I spend most of them doing a mix of hunting for pelts and meat that will help me upgrade my clothes and feed the camp; running a couple of side missions to get to know the crew; and maybe completing a story mission to move everything else along, or perhaps taking a trip to town to gamble, collect a bounty poster or just see what will happen on the main drag. I have my guns and a lasso, items to sell, money to buy whatever I need, and — new to the series — the option to chat with anyone. 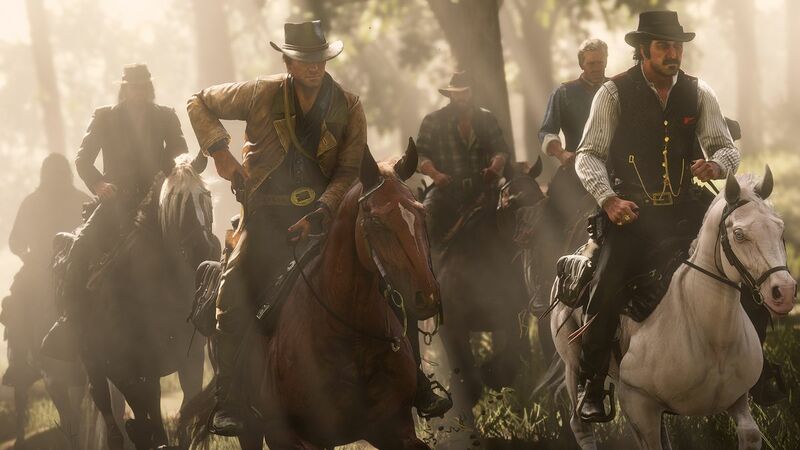 Rockstar has the hubris to create not just another open world paired with a laundry list of activities, but also a simulation that binds it together. When it works, it’s astonishing, affecting and unintentionally funny in the way real life can be. As I try to defuse a robbery, I notice my horse taking a massive and seemingly endless dump just behind me. A bunch of code is directing the hundreds of animals and people around this world, but where most video game characters and creatures feel as if they’re repeating the same path into oblivion, this world does just enough to feel like a live space — at least until you push against the edges. Generally, the pillars propping up the simulation can’t be seen, but sometimes — for clarity — the designers opt for standard video game iconography. Arthur has “cores” that symbolize his health, stamina, and ability to slow time and shoot a bunch of people in a jiffy. They sit on the screen like icons on a car dashboard, flashing when they must be tended to with food, drink or remedies. Gorge on food to keep health up, and Arthur gains weight. Go heavy on the liquor, and he gets drunk. There’s a balance to what you consume, so chewing tobacco might help your aim in the short term, but hurt it long-term. It’s intimidating at first until I begin to ignore the icons and just feed my pet Arthur before and after each mission. Treating him like a Tamagotchi that swallowed a bag of gravel makes the systems all but disappear. Arthur can engage with every character in Red Dead Redemption 2 by greeting them, antagonizing them or robbing them. It’s a limited means of communication, but an upgrade from so many action games that begin and end most conversations with a bullet. The trouble with presenting a fully interactive world is that, when the internal logic fails, the unrealistic reaction is all the more jarring. 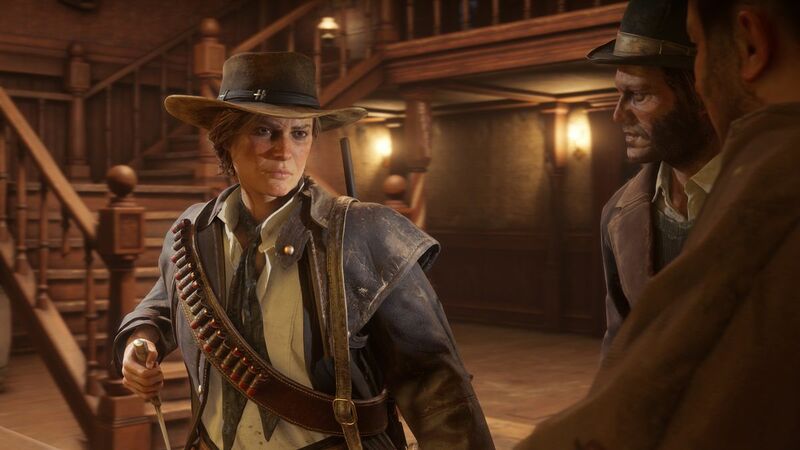 I don’t expect to interact with the generic crowds in Red Dead’s contemporaries, like Assassin’s Creed or Far Cry, but giving me the option to converse with every individual dramatically changes what I assume the game will allow me to do. Early in Red Dead Redemption 2, a captured rival, bound to a post, begs me for food. I pick up food, but I see no option to feed him. I can eat, which upsets him. But when I toss the food on the ground, he doesn’t react. Here’s another example: A crowd watches a public hanging. After the execution, the crowd disperses, and I find the victim’s mother weeping in the mud. I want to console her, but for whatever reason, the game won’t let me “greet” or “antagonize” the distraught mother. The only option it gives me is to pull a gun on her. While the game’s creators invite players to think of engagement beyond their weapon, it’s frustrating how few opportunities I have had to show empathy or compassion. A few years ago, I spoke with someone who worked on the Microsoft Kinect, and I keep returning to a point they made about designing for innovation. If something new works 99 percent of the time, that sounds great. But say the object in question is a phone, and the user checks the device 100 times a day; that means the device fails once a day. Suddenly, that extra 1 percent is unforgivable. The phone ceases to feel like a natural appendage and becomes more like a tool. When the systems in Red Dead Redemption 2 fail — or don’t live up to their promise — it changes how I play. Initially, I tried to spark my own stories with the people in the world. Now, I respond to the world, rather than hoping it might respond to me. The exception to this rule, somewhat, is communicating and cooperating with Arthur’s fellow gang members. Each member of the Van der Linde Gang has their own backstory and ambitions, which are communicated if you chat with them around the campfire or over a meal. I join them on everything from fishing trips to home invasions, where they share insight into their lives. Hours of conversations can be had in the camp, and I am happy with how the game’s conclusion rewards those conversations. Each member of the crew fits into the larger plot; getting to know them makes later dramatic turns all the richer. The people of color in the gang carry the additional burden of introducing Arthur — and, by proxy, the player — to the reality of how America treats them. Where white members of the gang concern themselves only with the next heist, black and Native American members worry as much about their own survival. Arthur is impossibly naïve, to the point that Lenny, a black member of the gang, must explain that plantation owners would consider lynching him for the color of his skin. Charles, who is Native American, helps Arthur hunt and acts as a liaison with a tribe that, he explains, has been shuffled from reservation to reservation as the government caters to oil barons. I don’t believe Charles’ tribe is ever identified, though he works with Arthur to help the Wapiti, a fictional tribe that Rockstar PR told me is “not modelled on a specific tribe,” but is a “mix of Native American peoples who have been pushed together by the changes being forced across the entire region.” The game’s mashing together of real-world people, locations and groups into single entities produces story beats that range from benign to confused to insensitive and harmful. Characters regularly speak about their experiences with bigotry, but the game mostly keeps the mechanisms of white supremacy at arm’s length. At one point, Arthur takes Lenny drinking, only for his friend to get mobbed by the cops. But the next time he sees Lenny, all is well. Lenny reflects on the night at the saloon the way a frat boy flippantly jokes about an evening of memories erased by blackout drinking. A couple of times, I come across a mob of Ku Klux Klan members holding a cross burning in the woods at night. On one occasion, they light themselves on fire. On another, a few members are crushed beneath the weight of the large cross. The face of white supremacy is played for slapstick comedy, betraying the reality of a mechanism of hate that killed entire communities in acts of terror. In the real Gilded Age American South, the white hoods concealed politicians, law enforcement officers and business owners. Here, they cover up Abbott and Costello. The story’s final chapter is an exception, in which Arthur manages to be a participant in oppression and grotesque manipulation, while also being absolved of his role in the matter every step of the way. In this manner, Arthur’s journey is a lot like that of Forrest Gump. He stumbles through some of American history’s biggest and ugliest sins, oblivious to the scope of their evil, yet angelic in how he always finds himself on the inherent side of good. The commentary on the American South and the mythological Western genre works much better when Red Dead Redemption 2 focuses on entitlement and power. At the story’s midpoint, Dutch tries to leverage the conflict between two plantation owners in the game’s equivalent of rural Louisiana. They’re vile and richly drawn monsters, and there’s a certain pleasure in gradually dismantling their lives. Nearly every Rockstar game has lampooned cults, using them as a blunt metaphor for the American obsession with righteous salvation. But with Dutch’s gang, Rockstar has for the first time really captured a cult’s appeal and danger. Like so many fanatical leaders, Dutch exploits the insecurities and desires of his followers, promising them exactly what they want. He uses a Machiavellian approach to justify increasingly horrific missions. And he never stops punting. It’s always one more job till the big payday that will turn everything around. He’s a huckster, and the parallels to modern politics are clear, despite Rockstar showing — at least in this respect — an uncommon restraint. A positive, meta side effect of Dutch’s strategic messiness is how failure makes for memorable and unpredictable missions. In previous Rockstar games, a series of missions anticipated a big heist. In Red Dead Redemption 2, a conversation at camp can be interrupted as Arthur is given a gun and a mask and a plan with little notice and less foresight. The game is set at the turn of the 20th century, but missions play out like the jobs in Michael Mann’s iconic heist film Heat (a film that Rockstar revisits for inspiration in game after game). Arthur and a selection of gang members enter a bank or train or business with a few guns, an outside factor interferes with the plan, and they must react on the fly to stay alive and get away with whatever they can. The gunplay and combat isn’t dramatically improved from Grand Theft Auto 5, which is to say, in 2018, it’s serviceable. The more that missions focus on the busy work of a heist rather than on nailing headshots, the better. With each heist attempt, the region responds to the gang like an infection. The group targets plantation owners and heirs, power brokers, robber barons, and a pre-Progressive Era federal government, but a couple dozen folks eking out a life on the fringes of a small trading town can’t compete with hulking institutions powered by an unlimited supply of money and weapons, soldiers, police and mercenaries. In short order, their simplistic “Wild West philosophy” gets crushed beneath a time and a place that’s too complex for them to comprehend, let alone compete with. The game’s writers set a foundation that feels as though it could use individual characters to launch a further-reaching story about cultural systems, like the books of James Baldwin, the TV shows of David Simon and the films of director Steve McQueen. But ultimately, the story is too sentimental, and the game too loyal to the video game story trajectory, in which missions become bigger and more explosive, rather than more critical and introspective. The final acts’ required missions vacillate between various styles of genre fiction, zipping from Uncharted-like action set-pieces to a horror showdown with inbred families. As the game spirals in its final chapters — in tone, in ambition, in message — I can feel the circumstance of its creation. This isn’t the magic of elves; it’s the creative hodgepodge of thousands of individuals. On the one hand, this is damning. Scale hinders specificity, and a story about the tragedy of the American South demands specificity. It’s hard to even gauge if Red Dead Redemption 2 achieves its own goals, because by the end, it appears to be a bit of everything: a violent shooter, a cracking heist flick, a meditation on mortality, a high school American history class. On the other hand, even with the tonal messiness, the game routinely centers itself around a valuable philosophy: The golden myths of the Wild West era, the stories of dime-store Westerns, are just that — myths. And that allows for it to be something for everybody, even when that something isn’t always for me. At its best, the story breaks away from the Western genre and plays like a cross between a heist movie, a domestic drama and a political thriller. At its worst, it’s a buddy action comedy. Mercifully, it manages to be more of the former than the latter. After Red Dead Redemption 2’s story concludes, a huge epilogue begins, and the game’s already gargantuan map grows even larger. I’m eager to dig into this postgame, where it seems I’ll be free to focus on taking in the beautiful, meticulously simulated world, rather than hurling myself into the middle of it. The coda reminds me of a trend that has benefited other open-world games through expansions — a smaller, more straightforward tale that makes use of this big, expensive world without having to justify every inch of its existence. The original Red Dead Redemption was about the future: how the colonizers of the West themselves couldn’t escape the encroachment of U.S. law, that the state would claim a monopoly on violence. Red Dead Redemption 2 is about the past — how it was never what it seemed; how it can be weaponized against the present; that reality is nasty, knotted and often deliberately obscured by the oppressors. From the start, Calloway’s biographer plans a hagiography not of the intoxicated man at the bar in the middle of nowhere, but of a gunslinger who never existed and a place fondly reimagined. Along my journey, I make time to visit his gang members. I don’t find heroes; I just find folks hustling out a life in a country that has no interest in whether they live or die, unless it’s published in a page-turner. I can talk with them or antagonize them or shoot them. It doesn’t really matter. Calloway’s book will end up the same. And it will sell a million copies. Posted in Uncategorized and tagged #American, #Assassin’s Creed, #Calloway, #David Simon, #dutch, #Dutch van der Linde, #Far Cry, #gaming, #GTA5, #hacked, #James Baldwin, #KKK, #Ku Klux Klan, #mcsc, #mercenaries, #money, #New York magazine, #open world, #police, #RDR2, #Red Dead Redemption 2, #review, #Rockstar Games, #role-playing, #RPG, #soldiers, #Tamagotchi, #Texas, #TheMessiah, #U.S. law, #weapons, #West, #Wild West philosophy.